After last week’s revelations, Liv scurries out of the building avoiding being seen by Blaine. She angsts about Lowell’s source of brains – and has another flashback as she sees Blaine’s assistant, Julien and a definite vision of Blaine murdering people for brains. She sees many brain bags in the back of his car. Ravi is a little worried after being bitten by the zombie rat – but he’s also a scientist and is carefully monitoring himself in case there’s any changes. Liv rushes in and spills everything in quick splurge of information. They realise there has been some kind of shenanigans over finding the bodies of the missing kids – they realise they have a police cover up. It also means that Major is right (and Liv feels guilty for making him back off) and she thinks Lowell must know where the brains are coming from. Ravi reports Major is increasingly becoming isolated and staying to his room – and we drop in on him to see him watching videos about guns now he has his new toy. Ravi desperately tries to distract the still obsessed Major with computer games. Liv goes to confront Lowell. Who insists Blaine told him the brains came from a funeral home. Liv isn’t buying that, Lowell is a zombie who has visions how could he not realise they were all young and how could he not know all his meals were murder victims? But Lowell says that most of his brains AREN’T young or violently killed and, because he isn’t investigating murders, he doesn’t actually come across vision triggers that often (and doesn’t try to seek them out as Liv does). He also adds that he was desperate and starving and he had no choice but to turn to Blaine (who turned him). Lowell takes the worst possible moment to ask why Liv doesn’t want to talk about “us” but she stomps all over that – she cares about the murdered homeless kids and wants Blaine’s number. The Little Brother, Harris, tells them that Everett has an ex-wife who isn’t a fan. Liv heads back to the office to eat Everett’s brain but even she admits she’s doing it as much to cleanse her mind of visions of Jerome as to help solve the case. Of course, new brain means new personality – that of a soldier. Which isn’t exactly relaxing when interviewing Everett’s ex-wife Penny and her new husband, Sean mentioning how the custody battle meant Sean had to turn down a very lucrative new job. Penny also says Everett had PTSD but resisted treatment – and only left the service and made Anna, their daughter, a priority when he saw she was getting a step-father. Sean has an alibi, Penny’s alibi is the daughter, Anna. They interview Anna but she doesn’t want to talk – and we have a vision of Everett attacking Sean and Penny telling him to get out while brandishing a knife. Liv passes on the vision to Clive but they’re both surprised Penny didn’t report Everett’s attack to the police since it would have helped the custody battle. Liv also inherits Everett’s PTSD which means midnight exercise and taking down everyone at paintball (and finding a shell casing in a place it shouldn’t have been). To Ravi! Who points out she cheated for her paintball trophy ion between asking Liv how she knew she was a zombie – and learns liv craved brains from the very moment of rising. Ravi clearly doesn’t have this. Ravi also asks Liv what she would have done if she couldn’t become a pathologist – speaking in defence of Lowell and his ignorance and desperation. Liv doesn’t accept “Lowell didn’t know” as an excuse because she sees it clearly as “Lowell didn’t want to know.” Ravi also points out what a luxury it is for Liv not to know whether she would have done the same. Liv and Clive go looking for Everett’s journal that his therapist advised him to keep but they find only one entry “one is less than many”, a sniper’s mantra and a way with dealing with killing people (by killing this one person, you save many more). They also find his sniper rifle – which a vision reveals Little Brother Harris messed with much to Everett’s disapproval. Time to interview the kid with his pictures of dead soldiers and a school record covered in anger issues – but more investigation shows that Harris was actually improving since Everett became his Big Brother. Next clue – Penny and Sean’s new neighbour (they live in a very rich neighbourhood) filed a noise complaint against them and now thinks they’re messing with his sprinklers and his lights (ooookay?) but all he adds is the tail end of Penny driving a violent Everett off with a butcher knife, complete with murder threats. Lowell shows Liv the menu Blaine sends – and she is outraged and horrified that Blaine kills teenagers and then makes cutsey recipes out of them. Liv decides she has to kill Blaine. They make a plan with Lowell luring him in and Liv planning to use her elite soldier skills. 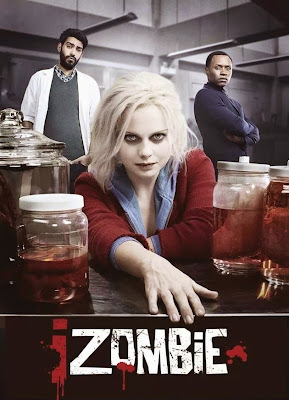 At the morgue Liv catches Ravi smelling brains and learns that zombieness doesn’t cross species – which means Liv has to learn Ravi was bitten and kept it a secret – Liv disagrees. Time for Clive with a break in the case – Sean’s company is involved in such tech wizardry that he probably did mess with his neighbour’s sprinklers and lights. That company is involved in drones – drones that could shoot Everett from 15 feet in the air solving the problem of the shell casing and the trajectory. Blaine has his minions packing brains and, in between him revealing how sad he was over Kurt Cobain’s death, he gets a promising invitation from one of his rich and influential clients. Mr. Kaisar wants a change of product; brains from runaways and junkies are boring and depressing. He wants Blaine to kill him people to order – starting with astronaut Alan York and he’s willing to pay a lot of money for it. Liv steals Everett’s gun while considering the oath she took when she started medical school and what it means to regard some life like a virus – and one that cannot be allowed to spread. Despite that… she can’t do it. “If you kill a virus you’re a doctor. If you kill a person, you’re a killer.” She can’t do it. He then calls Clive (who should really answer with “I’m sorry, did we become friends when I wasn’t looking?”). Clive tries to reassure the freaking out Major that it may be hard but killing an armed intruder isn’t doing something wrong – but Major can’t get past the killing a person thing. Of course, Julien is gone when they go to investigate – zombies are tough – and there’s no blood on the floor either. Clive asks Major if he was taking meds – or stopped taking them. Julien calls Blaine to let him know it all went wrong – and Lowell has a flashback – a flashback of Blaine killing Jerome. A whole lot of emotion there – he gestures that he loves Liv, who has put down her sniper rifle – and attacks Blaine with a BBQ fork. Blaine shoots him in the head…. There is an interesting point Lowell makes about the visions – usually we see Liv seeking out the visions for investigating purposes… but if you’re not actually investigating murders then triggers are likely to be something you’d actively avoid and suppress. We see them as advantages through the context of the show, but this brings up the intrusive nuisance of them. Also major points for “I’m in love with you.” “well that’s going to be a problem.” On some shows, that declaration of love from a hot guy (and, as far as Liv is concerned, perhaps her ONLY chance of love ever again) would be enough to forgive any and all sins. Not Liv – love does not make the dead go away. I love how both Liv continued to argue that wilful ignorance is not an excuse and “ask not questions get told no lies” isn’t exactly moral high ground or defensible in the circumstances. Yet at the same time, I kind of love how Ravi points out she can be so judgmental of Lowell because she has not been in his situation, she has had a morally acceptable source of brains, especially when you consider how extreme the craving gets and how violent a hungry zombie is. The condemnation coupled with knowledge that it’s easy to condemn when you have an out mixed in with not forgiving just because he’s a love interest and then throwing in Lowel’s emotional realisation of what they are and the cowardly distance he had embraced to avoid that… that was really excellent. All together it makes for an excellent apology/forgiveness/understanding arc – but I think it’s lessened by them ending up naked in bed afterwards (because of that established trope of “my boyfriend is hot, who cares what he does”). Taking that emotional stark realisation we then have Mr. Kaisar who comes from the other end of the spectrum – he WANTS the visions, seeking them as an experience, as entertainment. It’s another nice twist on ways different zombies see the visions. Then there’s likening Blaine, with his rapid infections, as a virus to be stopped – that’s such a perfect link to her medical school history. Throw in the whole moral morass of this whole episode on whether it’s moral to kill in revenge, in pre-emptive defence, in defence of others and… gah soo much here! Damn it – I want to fanpoodle! But there’s still some issues with iZombie like this that stop me just revelling in how much I love it.